Conductive hearing loss, sensorineural hearing loss, mixed hearing loss and auditory processing disorders are the four broad categories of hearing loss. The difference between these types of hearing loss depends on where the problem is located across the hearing system. Sensorineural hearing loss is caused by damage to the cochlear or the nerves that carry information about sound waves to the brain. It is the most common form of irreversible hearing loss and can be experienced in either both ears (bilaterally) or in one ear (unilaterally). It can can range from a mild form to profound form. To better understand different types of hearing loss it’s important to first understand how our hearing system works. There are three major parts of the ear: the outer ear, middle ear and inner ear. Sound waves travel through the outer ear and cause the eardrum to vibrate. 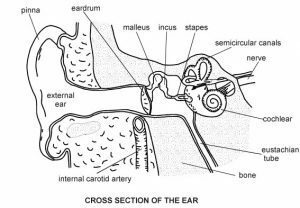 The ear drum (tympanic membrane) is connected to tiny bones (ossicles) in the middle ear. Therefore, when the eardrum vibrates due to sound waves striking it, the tiny bones start moving which causes parts of the liquid in the inner ear to move. These movements differ according to the loudness and pitch of the sound and are detected by the auditory nerve that carries this information to the brain. In the brain this information is processed so that we can recognise it as sound. In short, sound waves set parts of our hearing system into motion that eventually trigger electrical signals to be carried from the cochlear to the brain via the auditory nerve. What are the causes of sensorineural hearing loss? Can sensorineural hearing loss be treated? Yes, sensorineural hearing loss can be treated in a variety of ways. The best treatment option will vary according to your needs, the cause of hearing loss and the severity. An Hearing Choices audiologist can collect your case history and conduct a comprehensive hearing test to determine the best treatment option for you. Cochlear implants and hearing aids are the major treatment options for sensorineural hearing loss and are discussed below. Other treatment options include medication or surgery for Meniere’s disease, removing exposure to ototoxic drugs (drugs harmful to the cochlear), assistive listening devices and signalling and text display systems. Cochlear implants (also known as bionic ears) are electrical devices surgically inserted into the inner ear. Users wear a small microphone behind their ear that converts sound waves into an electrical signal. The electrical signal is then transmitted to the implant within the ear which stimulates the auditory nerve allowing the user to hear. Therefore,cochlear implants allow people to hear despite damage to the inner ear. Who are cochlear implants suitable for? Cochlear implants are suitable for individuals who are severely to profoundly deaf in both ears due to inner ear damage. Being young and having strong family support are additional factors that influence whether a cochlear implant is appropriate due to the period of rehabilitation/auditory training that is required following the surgical implantation procedure. Auditory training is necessary to teach the individual to discriminate between sounds and interpret what they’re hearing. How do hearing aids work and who are they suitable for? All hearing aids have four essential components: a microphone, an amplifier, a receiver and a battery source. The microphone detects sound which is then amplified and delivered to the ear by the receiver. Hearing aids are suitable for individuals with mild-severe sensorineural hearing loss.Your audiologist will help you select the device that’s best for you. 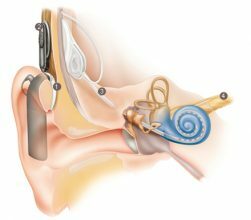 What are the different types of hearing aids available for sensorineural hearing loss?